Chalet Neva is within walking distance of the superb winter sports resort of Saalbach-Hinterglemm. You wont need your car while here. You'll find shops and other facilities just fifty metres away. The village centre of Saalbach is 300 metres away and the ski-bus stops on your doorstep. And you can almost ski back to the chalet. 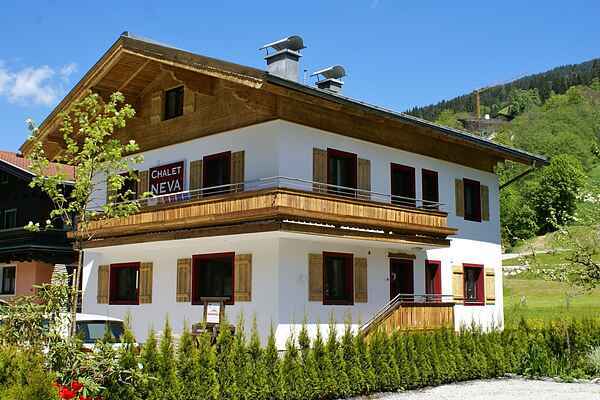 Chalet Neva is an ideal holiday accommodation. It has eight bedrooms and space for thirtien people. There is a pleasant private Stube, a living room and modern kitchen (with Nespresso and double hotplate) on the ground floor. And when you want to relax, the sauna is waiting. Saalbach-Hinterglemm is a wonderful, world famous skiing resort. There are so many kilometres of ski-slopes and they are open from early December until mid April. You can also enjoy cross-country skiing, tobogganing and the very popular après ski. Its all here in Saalbach-Hinterglemm. You can enjoy exhilarating walks and sports in summer. And youre very near most of the wonderful places the Salzburgerland has to offer.